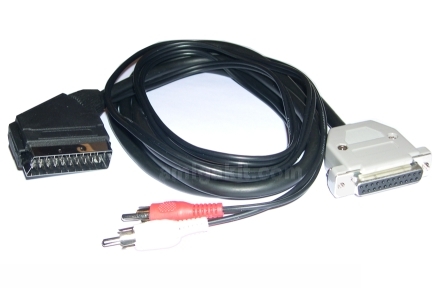 Cable is 1.5m long (approximately 5 foot) and terminates one end in a standard SCART male connector. The other end terminates in 2x phono male connectors: Audio Left , Audio Right and 23-pin female RGB Video connector. Compatible with Amiga 500, 500+, 600, 1200, 1500, 2000, 3000, 4000, 4000T.